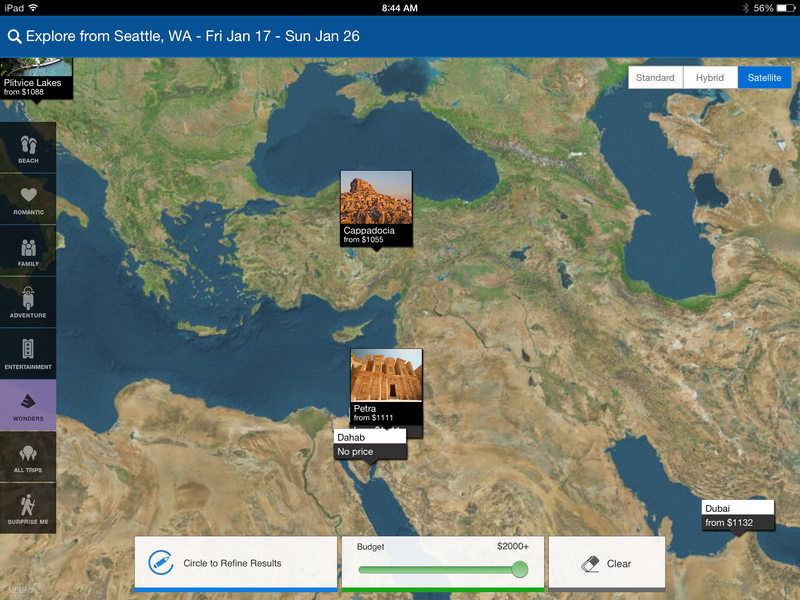 In the latest version of Priceline’s iPad app, users can try out a new “Explore Destinations” path. Users input a date and city of origin and then choose from one of eight “interest” categories: Beach, Romantic, Family, All Trips, Adventure, Entertainment, Wonders or Surprise Me. After choosing a theme users can zoom into a particular region (i.e., view it from a lower virtual altitude) by circling it with their finger. This does not expose any additional destinations but makes it easier to see existing destination markers since they often overlap at higher altitudes. Priceline is using a TravelPort “inspiration engine” rather than it’s own back-end to power the new user experience. I tried out the “Explore Destinations” feature and I was… underwhelmed. The destinations and content are far too sparse to be of value to a typical traveler. For example I chose the Wonders category, which has an Egyptian pyramid as its icon. I found that the results, ironically, don’t feature any destinations in Egypt. As you can see in the screenshot above, the only two wonders Priceline displays near Egypt are Cappadocia in Turkey and Petra in Jordan. I found no content (beyond a thumbnail image for some destinations) to actually inspire travel to the destinations. Given tablets’ major role as media consumption devices, I expect to see destination travel guides with photos, videos, recommended attractions and tours. The concept is ideal for users looking to buy vacation packages with flights, hotels, car rentals and in-destination products like tours. However, the only travel product you can purchase on the “Explore Destinations” path is flights. To book hotels (the only other product in the app), you have to return to the top level of the app. Priceline has labeled the “Explore Destinations” path “Beta” but it is really a limited proof-of-concept. Releases are traditionally given the “Beta” tag when they are feature complete. This feature cries out for the inclusion of more content and vacation package products. I want to be clear with my criticism: I found nothing buggy in the experience; it is simply too limited to be of significant value with its current scope. My guess is that Priceline wants to make this thin slice of functionality public to see how users respond to it. The idea is to tweak the design based on usage. This Agile approach is how some of the most successful software is developed nowadays. I disagree with Priceline’s apparent definition of the minimum viable product. A minimum viable product for exploring destinations needs to have more destinations and actual destination content. Without these, the initial user response to the feature will not be representative of its potential. I would not have shipped it until more content was integrated. Tnooz has a bit more information on the app. I tried out Adioso.com and got the same feeling I get with most semantic travel search engines–I can see the potential, but it needs to understand users’ intentions better before the majority of users will want to adopt it. It misunderstood more of my queries than it got right. To be fair, I work with natural language (NLP) search every day, so I didn’t try the easiest queries–but neither did I try impossible ones. In my mind it should have been able to give me a result for “Cheap flights from Seattle to Hawaii around February,” but it tokenized “around” with Hawaii instead of February and thus failed to nail the destination. Apart from the typical NLP issues, I think the Adioso.com site is executed fairly well. It has a feedback feature to help correct natural language recognition failures, the design is clean and the site is relatively easy to use once you play with it a bit to understand its quirks. 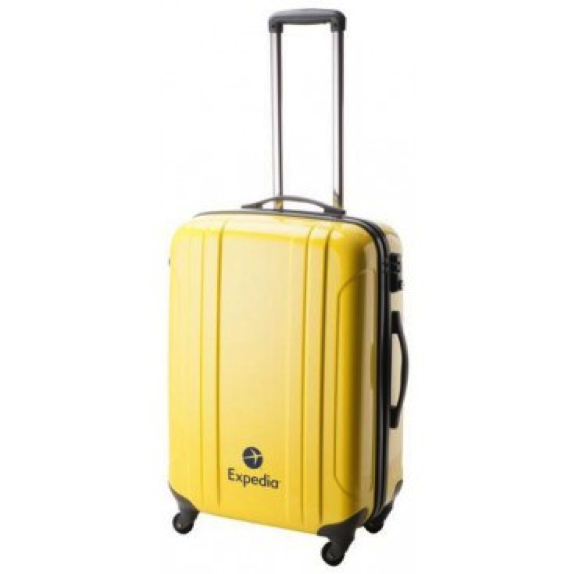 I’m auctioning off a genuine Expedia Yellow Suitcase!!! Want to do a volunteer vacation? Habitat for Humanity needs volunteers for India projects! Lesson to be learned here: Do 10 seconds’ worth of Google research before setting out on vacation. Lesson to be learned here: If you’re going to be drunk in a taxi, make sure the driver is smarter than you are. …and the lesson here is that Americans aren’t the only one with geography issues (we confuse Australia and Austria, for example). [Thomas, attempting humor]: No wonder I never realized my expectation of seeing guys in lederhosen during the eight years I lived in Australia! Bali is one of my most favorite places I’ve ever visited. However, since the “Eat, Pray, Love” phenomenon, it’s been a bit overrun. Here’s how to enjoy it in spite of the crowds. Last edition’s links delved into Groupon travel deals. This week it’s LivingSocial’s turn. A lot of local tech companies give unlimited, untracked vacation time. It’s an interesting idea, but there are some down sides. But regardless of vacation policy, Americans just aren’t taking their days. Half a billion days are left unused! Two “Must Do” lists: First off, charming World Heritage cities…Luang Prabang is on my itinerary for next year, which have you been to? And awesome architectural landmarks around the world. Breakfast, according to the rest of the world. My personal fave: chocolate and churros for breakfast in Spain! But if you don’t require sunshine, Paris is amazing no matter what season you visit. Here are winter must-dos. Or….maybe you want to fulfill your ENTIRE bucket list in one trip. Here’s an itinerary!! I was pleased to see that 2 startups that I had previously cited for innovation, Peek.com and Mygola.com, won Travel Innovation Summit awards at this years PhoCusWright conference. TripAdvisor: Wouldn’t it have been easier to buy an existing metasearch player like Hipmunk rather than roll your own? Orbitz: You’ve done a few interesting things, but are you really improving your competitive position. HotelNewsNow editor Jason Freed reports on his visit to Expedia HQ. He met with several Expedia leaders and observed the innovation lab. Speaking at the PhoCusWright conference Dara Khosrowshahi made it clear that Expedia Inc’s leaders have no regrets about spinning off TripAdvisor. Expedia-owned Classic Vacations is seeking to build loyalty among travel agents by requiring all bookings to be made through them. SafelyStay wins grand prize at PhoCusWright event – Travel WeeklyThe PhoCusWright awards are the Oscars of the the TravelTech world. I was pleased to see that two startups I have cited for innovation, Peek andMygola, were award winners. Outgoing CEO Jeffery Boyd says he is leaving because “the time is right.” Which I take to mean that he feels the company is on the right trajectory to make the transition without significant disruption. Darren Huston will remain as president of Booking.com while taking on the Priceline CEO mantle. Huston plans to stay in Booking.com’s home city of Amsterdam and Beckler says he’s right to do so. Huston should focus on ensuring that Booking.com continues its successful growth and not worry that other units of Priceline will feel neglected. Booking.com should continue is successful strategy of leading the market in SEM and continually improving the site through A/B testing. It should not get distracted into trying new strategies such as TV advertising. Huston should resist the urge to merge the eclectic technology stacks of the different Priceline units. Booking.com is doing just fine with Perl thank you. Actually, as a competitor, I hope Booking.com sticks with Perl. It’s a fine language in limited doses but trying to maintain an enterprise scale Perl deployment and recruit top software engineers who are willing to work with it must be a challenge. Becklers last piece of advice is to keep making bold bets to keep ahead of fierce competitors. Not bad advice. Again in the comments section, two of the three comments from readers disagree that Booking is beloved of hoteliers. Given Expedia and Priceline’s approximate billion-dollar Google ad spends Gerstner is correct. His startup strategy is not to complete head-on with the large established players, but to out-innovate them. Startups cannot complete in SEO and SEM, but mobile and apps are promising areas for innovation. While TripAdvisor is working hard on metasearch, it has no plans to become an online travel agent. TripAdvisor doesn’t plan to become an Online Travel Agent, but in the case of mobile, it needs to make metasearch bookings less painful. In its current mobile experience, users are directed to a supplier or online travel agent mobile site when they enter the booking process. They then have to manually return to the TripAdvisor mobile experience if they want to check out another deal. TripAdvisor’s plan is keep the user in the TripAdvisor experience all the way through the booking process but have the supplier/OTA process the actual booking and be the merchant of record. Bing’s TripAdvisor hotel metasearch is integrated with to include a “business listing” of up to five hotels positioned on top of or within the organic search results. The metasearch feature is activated in response to queries that include a U.S. destination and the term “hotel” or synonyms such as “lodging”, “accommodation” or “places to stay”. Users can enter dates and click on a “Find Rate” button to see a full-page metasearch results list and map. TripAdvisor replaces Kayak, which previously powered Bing hotel search results. Skyscanner opened it’s first American office in Miami recently. I find Miami an interesting choice: It’s a thousand miles further from the Skyscanner head office in Edinburgh than northeast U.S. cities and it doesn’t appear on lists of tech-startup hotspots. However,Miami is seen as a tech hub for Latin America. Perhaps Skyscanner plans to make Central and South America a key part of its overall Americas strategy. Goldstein see metasearch evolving into a supplier-dominated channel, cutting out OTAs. Groupon is leveraging its acquisition of last-minute single-night booking company Blink to provide the new feature. CEO Barney Harford argues that Orbitz can take risks that its larger competitors will have a hard time accepting. Users earn 5% for mobile device hotel bookings, 3% for hotel bookings through other channels, and 1% on flights and vacation packages. Orbitz uses its CheapTickets brand as a place to run experiments and try out promotional ideas. Orbitz’ stock price has tripled over the last 12 months. Harford dismisses metasearch, saying it is becoming a commodity. OTAs are outbidding hotels and winning significantly more ad auctions that involve keywords based on the hotels’ own brands. In some respects, Google’s go-slow approach with its travel products makes sense. Google makes a lot of money selling ads to Priceline, Expedia and other travel companies and it would want to be careful about losing ad revenue too quickly as it grows its own share of the travel market. Predictably, Travelzoo’s share price dropped–by one-third–on the reduced revenue. The Freehand Miami hostel is similar in concept to those in the Europe’s Generator hostels chain. Following the success of the Miami property, a Freehand Chicago is planned for 2015. Hotel industry experts have been saying for some time that brand loyalty is low in the sector. This article summarizes a white paper on loyalty programs written by Henry Harteveldt, an analyst with Hudson Crossing. I have followed Mr. Hudson’s work for some time and have a lot of respect for his analyses. The state sued Expedia, Orbitz, Priceline and Travelocity. Maybe the area’s tech companies have received too many tax breaks. My brother, who is a pilot/instructor for a major U.S. airline, believes that pilot’s flying skills suffer when automation is overused, especially during takeoffs and landings. Other experienced pilots agree. For example, Captain Jeff Nielson, who hosts the popular AirlinePilotGuy podcast, emphasizes the same point. I agree with their assessment. We can’t expect pilots to recognize and respond to critical situations adequately if they spend most of their flying time watching automated systems fly the plane. Unless and until we trust automated systems to fly planes one hundred percent of the time, we should insist that pilots spend a significant amount of time manually piloting their aircraft in all phases of flight. There is no safety or technical reason to prohibit the use of mobile devices on planes. 55% of respondents oppose allowing cellphone calls during flights. Probably because they fear scenarios like this. The FCC should ask Miss Manners whether to allow cellphone calls during flights. She already has a few rules for making flying a bit less unpleasant. The E.U. is following the U.S. Department of Transportation’s lead to allow the usage of personal electronic devices in all phases of flight. The combination of an improving economy and reduced competition on some routes is likely to lead to higher prices for those routes. Some regional airports will have fewer flights. Carriers like JetBlue and Southwest will take over some former American and US Airways gates and routes. I’ve previously featured a new site, OptionsAway.com, that will sell you the option to lock in today’s price for an airfare you may purchase several days in the future. OptionsAway was initially limited to a small number of city pairs, but I see that that it has now added many more. OptionsAway offers a better deal than United for many city pairs and it’s available for several different airlines. Perhaps there is hope for economy air passengers after all. A few airlines are finding they can profit by offering better customer service without monetizing every service feature. Travelers outside South America may not be too familiar with LAN. It started in 1929 as the Chilean state airline, was fully privatized by 1994 and was recognized as the best airline in South America in 2013. Features like the five impressive new lounges covered in this article will go a long ways towards keeping it on top. This intriguing concept features movable armrest/dividers that are used to divide a bench seat into three. A Boeing 747-8 recently lost thrust in one engine while flying through an anvil cloud (anvil clouds form in the upper parts of thunderstorms and are mostly composed of ice particles). Subsequent analyses found that Boeing 787 and 747-8 aircraft equipped with General Electric GEnx engines can experience internal icing when flying through such conditions. Boeing has told airlines not to fly the planes within 50 nautical miles of thunderstorms that may contain ice crystals. Boeing and GE have identified a software-only fix for the problem and expect to make it available to aircraft operators in the first quarter of 2014. It’s not clear that it’s wise to sell off national assets, but Brazil couldn’t have found a better buyer; Changi is the most awarded airport in the world. AirlineReporter.com is a topflight avgeek blog based in Seattle. I liked so many recent stories that I’m consolidating them under one item. AirlineReporter.com « Aviation Geek Fest 2014 is Coming — You Ready? The Aviation Geek Fest, to be held February 15th and 16th 2014, is a great way to get a behind-the-scenes look at the industry in one of its greatest hubs, here in Seattle. “Lie-flat seats, designer amenity kits, and multi-course meals are now as common in business class as they are (or were) in first. But one small item is slowly making an emergence in business class, one that has always been thought of solely as a first class staple: airline pajamas. I’m including another article on pajamas in a TravelTech blog. Let’s leave it at that and not say any more. Sounds like a great way to fly to Europe. For a good part of the article, I wasn’t sure if it was a flight review or a food review; the in-flight meals sound pretty good. At this time of year, I’d rather go to Hawaii. Hawaiian’s economy service sounds great. Fascinating read (especially for those of us who live in the Seattle area) on the site where “a little over 50% of the world’s wide-body aircraft have ever been produced.” As the article mentions, Boeing offers tours of the facility. Most of us who live in the Seattle area have driven past this facility more than a few times. Many of us have friends and neighbors who work there. I have to say, the 737 facilities look very small to me. I once worked at Lockheed’s Fort Worth Division. The aircraft assembly line there is a mile long. This impressive flyover of a Kansas City Chief’s home game by a private squadron of homebuilt aircraft covered the sky in pink contrails and raised $25,000 for the University of Kansas Hospital’s cancer center. There were certainly some risks to the endeavor. With that many pilots, I doubt they all had the amount of close formation flying experience that is typical of such endeavors. In addition, the spotter pilot who flew underneath the formation remarked that he was flying under the tops of antenna and utility towers in the area. There was other air traffic in the vicinity, including a blimp and helicopters. They were able to make the case that they had mitigated the risks; they were able to secure official permission to carry out the maneuver after it was initially denied. The latest Qantas aircraft to celebrate Australian aboriginal art. The article has some nice photos of the other planes in the series too. There has been lot of buzz about European river cruises in travel blogs and podcasts lately. You get to experience beautiful scenery, interesting attractions, and great food and drink. And you see a large area of the continent while only unpacking your bags one time. Today’s behemoths raise questions of safety. For example, passengers are supposed to be able to evacuate on lifeboats withing 30 minutes of an evacuation alarm, a task that could be complicated by bigger ships. Note that this is a “Sponsored Content” article–more or less an advertorial–but it does offer some interesting insights into air travel revenue possibilities. Airlines don’t even need to use much-hyped “Big Data” analytics to identify up-sell opportunities. My observation: other travel companies such as OTAs also often have a long lead time between purchase and travel dates and could use similar tactics to increase revenue. If you must, be very careful what you say. On his last scheduled day in the country Newman apparently made the mistake of mentioning his experiences as a soldier in the Korean conflict. Motivated by paranoia and/or propaganda value, the North Koreans detained him. Education: The calibre of our educational sector encourages foreign students to become ‘education tourists’ who in turn encourage friends and family to visit. Healthcare.gov is not the only large IT project having teething problems. The sad saga of mileage inflation will continue in 2014 as the airline industry continues to consolidate. You’ll have to do the math for your own situation, but you may be better off using a cash awards credit card rather than chasing devalued airline points. What this means to consumers is that they may be missing out on great deals for Asian flights if they only search through an offline or online travel agency. Consumers will have a better chance of turning up the best deals if they use the airlines’ sites and metasearch. “A 777 should be nine seats across to give you a reasonable seat. An A330/A340 should be eight seats across to give you a reasonable seat. An A380 should be ten seats across the lower deck. Not eating, drinking or smoking in public places during the fasting hours (daylight) of the Holy month of Ramadan and all religious rituals and occasions should be respected. Now that U.S. government agencies have recognized the viability and legality of the Bitcoin virtual currency, more high profile firms are beginning to accept it. 84 year old Arthur Frommer and his daughter Pauline regained the rights to publish travel guidebooks under their own name this year and plan to publish 30 new paperbacks and e-books before Christmas. You gotta love Arthur. Most national, state and city tourist boards in the U.S. probably have a website. Skift dug into U.S. tourism website statistics–and then doublechecked when they found traffic numbers so low as to be unbelievable. Numbers ranged from 570,000 unique monthly visitors for NYCGo.com to 15,000 for ExperienceWA.com, the official site for Washington State. Tourism boards need to produce more compelling content and invest in SEO and SEM to increase their traffic. There are lots of useful resources for travelers in the list. To give you an idea of the kind of sites we’re talking about, here are the top five, starting at number one: Travel.yahoo.com, LonelyPlanet.com,Timeout.com, About.com Travel, and Wikitravel.org. This is good article for anyone who is serious about working with social media. If you’re an expert, you may already know much of what is discussed, but you can still use the article as an audit checklist to see if there are steps you should take to increase your social media effectiveness. The article calls out the pros and cons of various social networks. Starwood set up a Facebook page to promote deals from its various brands (Sheraton, Westin, W, etc.) and bought Facebook ads to encourage users to “Like” the page. It tracked clickthroughs and conversions from the page and calculated a $2 million net revenue increase over the few months the promotions page has been in place. IDeaS Revenue Solutions has added a social media reputation pricing feature to its hotel revenue management system. The idea is that hotel managers can compare the online reputation of their rooms to those of their competitors and price their inventory accordingly. If you manage a property with a better reputation than nearby competitors, you should be able to price your rooms higher than the competitions’ without losing too many room nights to them. Just a thought: OTAs have a lot of data on hotel reputations. They could offer services like this to their hotel partners to increase the value of the OTA-Hotel relationship. When I read the headline, I thought KLM was tweeting the wait time periodically in its feed, but they’re actually doing something more clever to avoid cluttering the feed. KLM inserts the wait time in its profile photo and updates it every five minutes. Unfortunately, the wait time is cropped out of the frame on the Twitter app on my phone. Total Travel Minutes are increasing across devices, and mobile device usage is up dramatically. Half of trip planning starts on an OTA, airline or hotel website. The greater part of the travel planning and decision process still occurs on personal computers. PCs account for around 85% of usage during the research, shopping and planning phases of the travel lifecycle. Only during the actual trip does PC use drop to 47%. Smartphone usage, which is under 20% for the first three phases, jumps to 31% during the trip. Tablet usage holds steady around 27 to 28% through all phases of the lifecycle. 43% of travelers post some sort of content after their trip. Referencing the same report, Skift highlights that prospective travelers spend more time researching lodging than any other aspect of trip planning. 84% of respondents said friends’ and families’ holidays inspire them and 83% liked looking at friends’ and families’ vacation photos. 65% said they were only aware of their families’ vacation destinations through seeing them on Facebook. 47% said they have browsed through Facebook photo to find out more about a destination. 58% said others’ experiences have encourage them to visit a place they hadn’t previously considered. 95% used Facebook during the booking process. 91% said they checked Facebook at least every couple of days while on vacation. 99% post vacation content to Facebook after they return. This is worth digging into if you want to understand more about how today’s travelers do trip planning. 57% of business travelers plan to extend a business trip to include leisure. The Internet and family and friends are travelers’ top resources for travel planning and inspiration. Leisure travelers spend the most time on search engines, then hotel sites, airline sites and online travel agencies. Business travelers dedicate their online activity to hotel sites, then airline sites, search engines and OTAs. Interestingly, far more mobile device-using travelers book on mobile websites rather than through mobile apps. In 2013, for the first time, more than half of travelers said they viewed online travel videos. They placed the highest value on “food discoveries” with 59 percent saying that was an important consideration in choosing a hotel. 46 percent said they feared missing out on friends’ personal news. Europeans feel the most vacation-deprived even though they receive and take the most vacation days! I tried out the site. Sadly for geek humorists, it seems that the autocomplete feature has been disabled altogether. There is no evidence that the attempted attacks were successful, but there were enough of them to train the autocompletion feature to offer them up as suggestions. The Guardian goes into more detail on theimplications of the attempted attacks. Mobile booking growth is impressive, increasing from just 2% of total bookings in 2011 to a projected 25% in 2015. A few details on how Facebook operates its data centers. The company invests in a lot of automation. Great bike trails plus New Zealand scenery? This is going on my bucket list! I’ve noticed that several of my Facebook friends are fans of Grumpy Cat. Watch Grumpy Cat out-grumpy Grumpy the Dwarf. I spent a week fishing for halibut earlier this year in the same vicinity as the writer of this article. 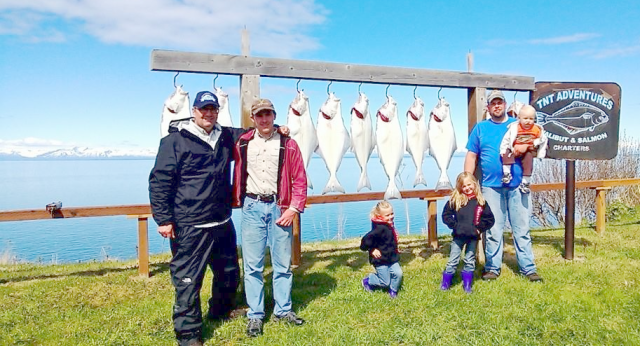 If you’ve ever dropped a line in piscine pursuits or think you might like to, I highly recommend halibut fishing off Alaska’s Kenai peninsula. The fishing is good and the halibut is tasty. At Seattle market prices, I reckon I brought back enough fish to cover at least half of the cost of the trip. I hate to break it to the writer, but my group caught, on the average, bigger fish. We didn’t even keep any the size of the smaller ones in his photo. Here’s one of my fish pictures. The catch that day was about average size-wise. We fished for six days and caught our limits every day. As selected by the professional reviewers at Oyster.com, who are probably losing their jobs following TripAdvisor’s acquisition of the company for its photo library. This breathlessly wordy article contains some interesting facts about the events that led to the creation of Disney World. This is very cool–like having a comfortable bed next to the fish viewing windows at an aquatic theme park. Go to the article and check out the slide show. That is sad. Paris is great, but other parts of France offer rich experiences for travelers. I’m glad my experience in France was not limited to Paris.